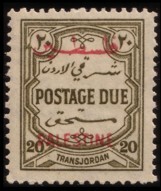 For the postage due stamps (issued on 2.12.1948) Transjordanian postage dues from various issues in several perforations (design types D26 and D35, issued since 1929) were overprinted by design type PD2 and PD2a. The two types differ by the horizontal distance between the first and second line. 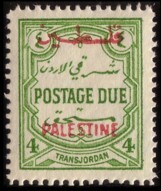 The overprint is in colours black, green and red, with shades varying between imprints. 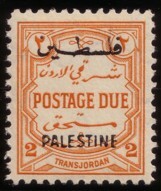 Issue 1929: design type D26 in perforation 14. Produced in recess printing by Perkins & Bacon. Watermark Crown Agents type W9. Values of 4, 10, 20, and 50m. 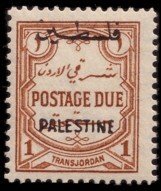 Issue 1939: design type D26 in perforation 13.5:13. Recess (Perkins & Bacon) with watermark W9. One value of 1m. 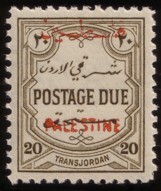 Issue 1944: design type D26 in perforation 12. Produced in recess by Bradbury & Wilkinson. Watermark W9. Values of 1, 2, 40, 10, and 20m. 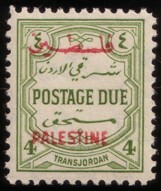 Issue 1942: design type D35 in perforation 13.5. 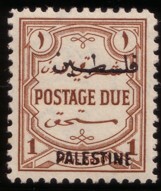 Printed in lithography by Survey Department in Cairo. No watermark. Values of 1, 2, and 10m. 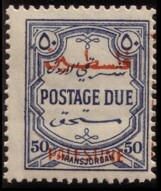 The perforation measures given are those listed in catalogues Michel and Stanley Gibbons. 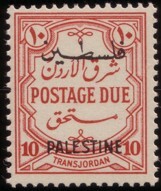 Stamps that I inspected show perforation measures that differ slightly from those figures, some by as much as half a point. 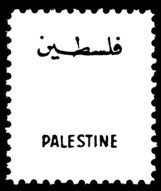 Since I don't have enough compararative material of the base stamps or the overprints, I cannot make further investigations into this problem.